A gang of youths have ambushed four buses on the same stretch of road in the space of 24 hours, launching stones and even a concrete block through the windows as they drive past. 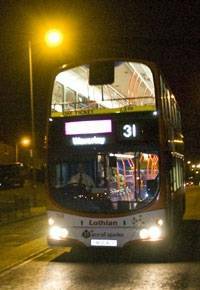 One passenger was showered with glass when the concrete block smashed through the window of a double decker travelling through Liberton. Another passenger, who had been sitting beside that window, had a lucky escape by getting off the bus just moments before the attack. Police have now launched an urgent appeal for witnesses to catch the "mindless" vandals before they strike again.